Finally, login with the new password just entered. That’s it! Need more help, just contact us. How should we store and handle our State Fair Mini Donuts once we receive them? If you’re not going to use your mini donuts 1 -2 days after receiving them, put them in the freezer. Please do not refrigerate your mini donuts because that will dry them out. They should be either frozen or kept at room temperature. For more details on storage, handling, reheating and other pertinent information about your mini donuts, please click HERE. How can we serve the hot mini donuts without needing a deep fat fryer? We have developed a process to deliver piping hot and fresh mini donuts in a very easy manner that does not require deep fat fryers. Our donuts come pre-made so you do not have to mix any batter or fry them. We eliminate the mess and safety hazards of a deep fat fryer. 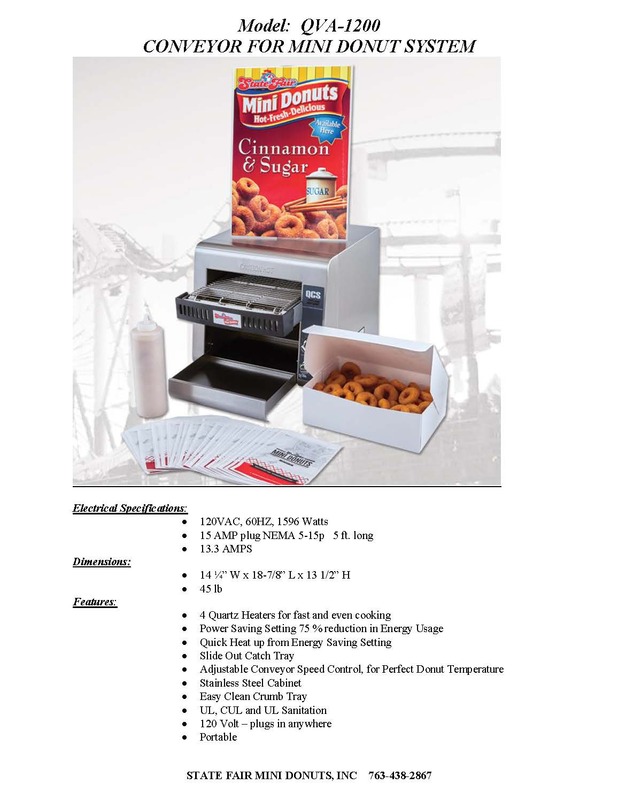 The mini donuts can be made to order by simply warming them in the State Fair Mini Donut Oven for less than 40 seconds, sprinkle the hot donuts with cinnamon and sugar and offer your guests delectable and profitable treats. What will we need to get started selling State Fair Mini Donuts at our venue? You need an oven, mini donuts, sugar, and bags. 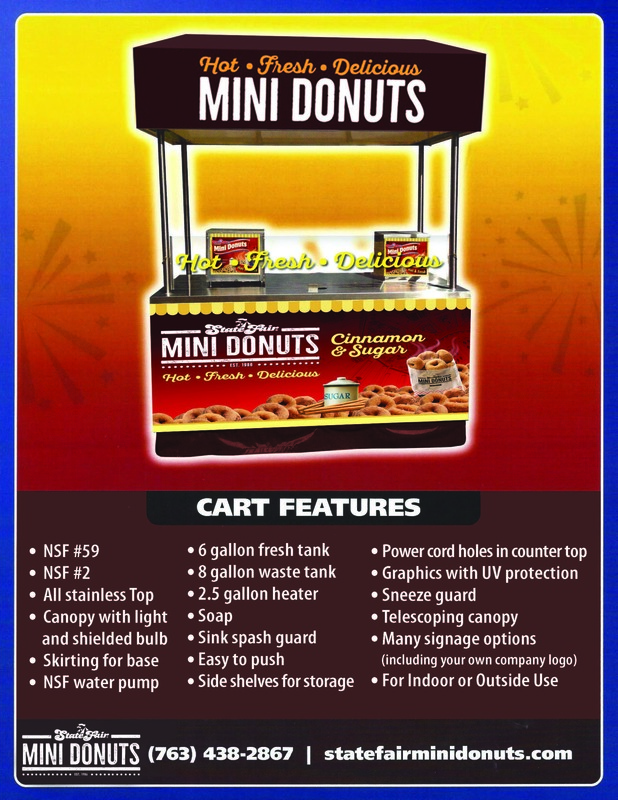 A State Fair Mini Donut Oven package is available and includes an oven, one case of donuts, Cinnamon and Sugar, a sugar bottle, a funnel, a mini-donut banner and counter signs. What quantities can I buy State Fair Mini Donuts? State Fair Mini Donuts are available by the case. One master case includes six boxes with 70 mini donuts in each box for a total of 420 mini donuts. The minimum order is one case. The mini donuts can also be shipped as a full pallet (70 cases) or a half pallet (35 cases) Please call 763.438.2867 to order in these quantities. Pallet orders ship frozen and have a discounted rate. What quantities can I buy the sugar? A case of sugar includes four bags that are five pounds each for a total of twenty pounds of sugar. What sugar flavors are available? State Fair Mini Donuts offers a variety of flavored sugars by the case including Cinnamon & Sugar, Salted Caramel Sugar, Apple Cider Sugar, and Pumpkin Spice Sugar. What is the allergen and nutritional information for State Fair Mini Donuts? State Fair Mini Donuts are produced in a nut-free bakery and are kosher certified. For complete nutrition facts, ingredients and allergen information, please click HERE. Do you offer food products other than State Fair Mini Donuts? Yes, we also offer delicious cheese curds. Please note there is a minimum order quantity of 30 cases of cheese curds because they must be shipped frozen. For more details, please contact us. How quickly are State Fair Mini Donuts shipped once an order is placed? Please note that all orders must be placed by Monday at 9:00 AM CST. Orders placed after 9:00 AM will be shipped the following week. We ship orders to the following states Monday Only: AZ, CA, MA, ME, NJ, NV, NY, OR, VT and WA. We ship to all other US states every Tuesday (except certain holiday weeks). Shipments typically take between 1 – 4 days, depending upon your location. When shipping direct, the minimum order is only one case. One master case includes six boxes with 70 mini donuts in each box for a total of 420 mini donuts. Yes, you will enjoy significant savings when ordering half-pallets (35 cases) or full-pallets (70 cases). For more details, please CONTACT US. How are State Fair Mini Donuts shipped? If you order by the case, your mini donuts will be shipped out at room temperature via FedEx. If you order a half-pallet or full pallet, your donuts will be shipped frozen via a frozen carrier. Will my State Fair Mini Donuts be pre-made? Yes, we fry and flash freeze the donuts to deliver them fresh to you. You do not have to mix any batter or fry them. We eliminate the mess and safety hazards. I have limited space, what size is the oven? The space-saving oven has a very small footprint of 14.25″ x 20″. It is portable with 120V and will plug into a standard outlet. The oven can make up to 1,200 mini donuts per hour and can produce one order in less than 40 seconds. The oven requires virtually no clean-up, simply wipe down at the end of the day. The oven is NSF and UL approved. The oven and donuts are so simple to use that you can train employees in less than one minute. For more details, please click HERE. How easy is it to clean and maintain our State Fair Oven? The oven is easy to clean, simply wipe it down at the end of the day. Two minutes a day will keep it nice and clean. 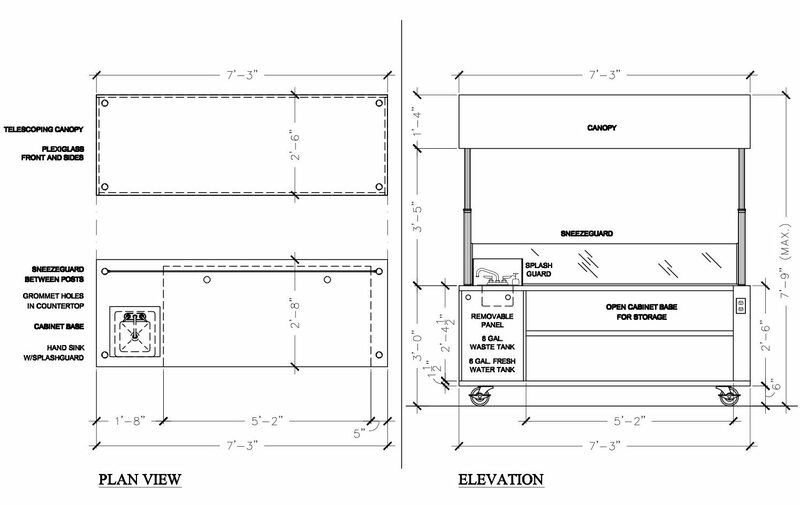 Can we use our existing oven? Yes, the Quick N Crispy and the TurboChef Ovens will warm your donuts perfectly. These manufacturers offer cooking instructions for State Fair Mini Donuts. Other ovens will work, but the baking time of your mini donuts will be longer. Where can I find information your mini donut cart? How easy is it to learn to use the State Fair Mini Donut Oven or train employees to use it? Most people can learn to operate and be trained to use the oven and sell the donuts in 1 – 2 minutes. The State Fair Oven also comes with a quick-tip operating guide making it extremely easy to learn to use. Do you offer State Fair Mini Donuts signs or banners? Yes, we offer a variety of marketing materials, clings, banners, and counter signs to stimulate sales at point of purchase. What products are available to help me sell State Fair Mini Donuts? We offer State Fair Mini Donut bags, souvenir mini donut buckets, flavored sugars, recipe cards, and a variety of marketing materials. In addition, we offer plastic replicas “Display Kit” of mini donuts to showcase in your display case. How many State Fair Mini Donuts are in a serving? Most venues offer a serving size of 6 to 12 mini donuts. Mini donuts add incremental sales because they are one of the only concession snacks customers will order morning, noon or night. State Fair Mini Donuts are a proven money maker, successfully operating at over 600 locations nationwide. 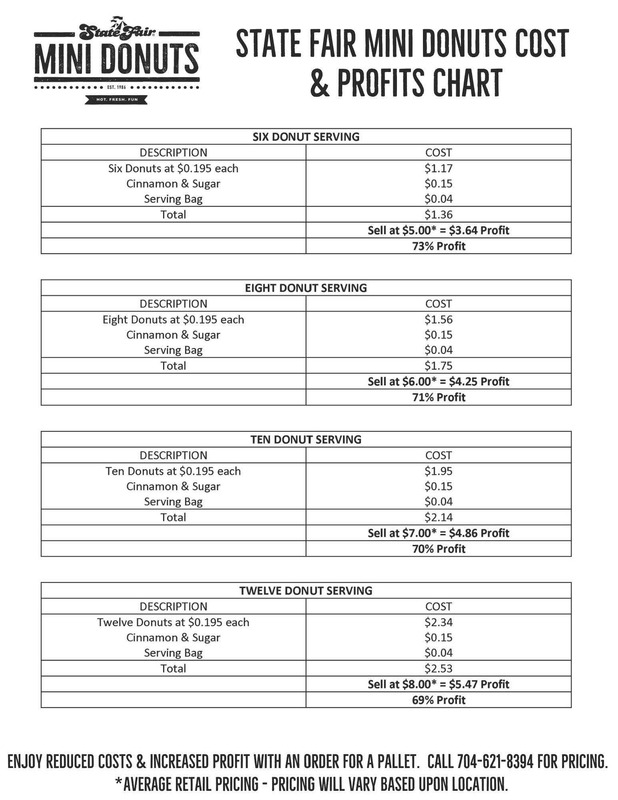 Most locations put between 8-12 mini donuts in a serving and charge 2 to 4 times their cost. For a breakdown of your associated costs and profit calculations, please click HERE.